Box filter matting decomposes with time and washing. Here are a range of different foams. We can supply many different media, but some of the main ones are listed here. Contact us if you can't see what you need. Very fine filtration to help remove suspended solids. 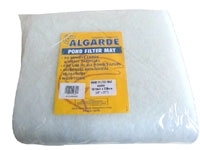 The small mat is ideal for smaller conventional filter boxes and can be trimmed to suit your filter size. 17" x 11". The Biotec 18 filter has 8 red and 8 blue foams. They should be replaced about every 3 years or when showing signs of damage. The fine, red foams are installed at the bottom and the blue, coarse foams on top. 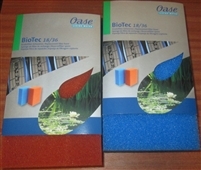 The Biotec 18 filter has 8 red and 8 blue foams. They should be replaced about every 3 years or when showing signs of damage. The fine, red foams are installed at the bottom and the blue, coarse foams on top. Replacement foams for the Biotec 10. 1 filter. Biosmart 20000 / 30000 systems. The 10.1 has 4 coarse, 4 fine and 1 extra fine foam. 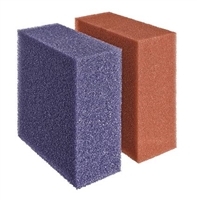 Replacement foams for the older Biotec 5 or Biotec 10 filter. 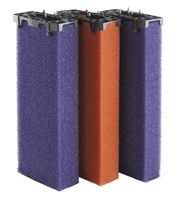 A pack of 3 high quality, dimpled filtration mats suitable for box filters. 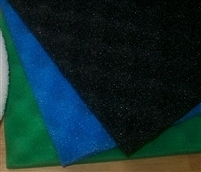 Supplied in 3 grades - coarse (black), medium (blue) and fine (green). 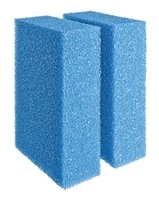 The filters should be cut to size and placed in the filter so that the water runs through the black foam first, then the blue and finally the green. 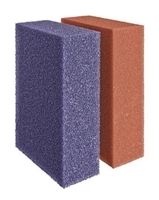 Filter foams should be replaced when the old foam has become lazy. ie. it doesn't spring open when folded over. Very fine filtration to help remove suspended solids. The mat can be cut to suit your filter size. 42" x 21". The Biotec 12 filter used to have 8 red and 8 blue foams. Oase has a new improved configuration of larger foams. You should buy 1 pack of blue (2 foams) and 3 packs of red & purple (3 of each). They should be replaced about every 3 years or when showing signs of damage. These foams are for the Biotec 12, the Biotec screenmatic 40000 and the 90000 (double the quantity). The Biotec 18 filter used to have 8 red and 8 blue foams. Oase has a new improved configuration of larger foams. You should buy 1 pack of blue (2 foams) and 3 packs of red & purple (3 of each). These foams are for the Biotec 18, the Biotec screenmatic 60000. For the Biotec 36 and 140000 double the quantity. The Biotec 12 filter used to have 8 red and 8 blue foams. Oase has a new improved configuration of larger foams. You should buy 1 pack of blue (2 foams) and 3 packs of red & purple (3 of each). These foams are for the Biotec 12, the Biotec screenmatic 40000 and the 90000 (double the quantity). The Biotec 18 filter used to have 8 red and 8 blue foams. Oase has a new improved configuration of larger foams. You should buy 1 pack of blue (2 foams) and 3 packs of red & purple (3 of each). These foams are for the Biotec 18, the Biotec screenmatic 60000. For the Biotec 36 and 140000 double the quantity. Replacement foams for the Filtoclear 11000. Replacement foams for the Filtoclear 15000. Replacement foams for the Filtoclear 16000. Replacement set of 3 foams for the Filtomatic 14000 & 25000. Please order 2 packs for the 25000. Replacement foams for the Filtoclear 30000 or 20000.